What is Equity/Credit and Symbol Specifications in MT4 Webtrader? The MT4 Webtrader offers a variety of symbol specifications that will help you with your trading equity. Take into account all that the MT4 Webtrader can offer you and become an informed trader. In the MT4 Webtrader, at the bottom of the screen you will find various details related to your trading equity. So what exactly are the terms that you see at the bottom of the screen pertaining to your account details? Profit: Profit section shows the current floating profit or loss on your open orders or trades. These tend to fluctuate depending on how the market moves. The Profit is not added or subtracted to the balance until the orders are closed. Balance: The Balance shows the total available balance in your trading account. Equity: Equity is a floating amount where the Profit is added or subtracted from the balance. A positive Profit would mean that your balance increases, while a negative Profit infers a lower balance if you close out your positions. The equity only provides a snapshot of how your account balance will be, should you close out all your open orders or trades. Margin: The margin amount shows the collateral that is required to maintain an open position. Margin is calculated as the [trade size x market price]/ leverage amount. 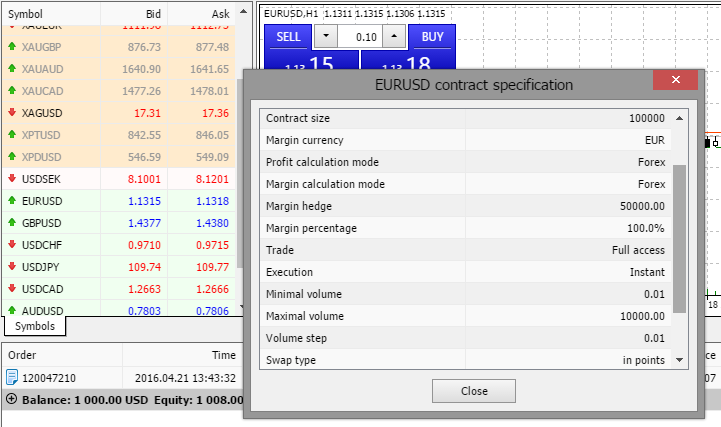 In the above example, a 0.1 lot EURUSD buy order was placed at the price of $1.1307. The account balance was $1000. The trade was currently running in a profit, therefore the Profit was showing $2, which brings the equity to $1002. The symbol or instrument section on the left side of the screen can be used to view the details on the instrument. Right click on the instrument of your choice, and select ‘Specification’ this is symbol specifications. This opens a window with details on the instrument. Swap points shows the units that will be added or deducted from your open position which is held overnight for every 100,000 units of position held. For example, if you hold a EURUSD buy position overnight -5.98USD will be deducted from your 1 lot position, or if you hold a EURUSD short position -3.9USD is deducted from your 1 lot position. Therefore, if your EURUSD long position was currently in profit at $200 overnight, then -$5.98 is deducted as swaps, bringing your net open position value to $194.02.